Opening day of the playground that was located by the Cromlet, across from the railway station. I recognise a few faces. I am in the picture front row 2nd in from right; next to me on the end is John Ross the teacher's son (Leakie). Super photograph Harry! Although I am not on the photograph I can remember this eventful day, we had to queue to get on the swings. The girl standing to the left of the man in the hat and single breasted coat is Margaret Gillies and to her left is Christine White. To the right of the same man is Eileen Mackintosh Anne Macleod and Sheena Woodburn and just behind Sheena to her right is Catherine MacLeod. The girl to the right of the shoulder of the same man could be Dorothy Peaston. Third row back 1st right is Terry Walker and 2nd right is Mary Campbell. Front row 3rd right is Nora Galloway; 4th right is Rosalie Graham and 5th right is Seonaid MacDonald. Hi Anne, the man in the single breasted coat is, I believe, the Provost (George); immediately behind him is Charlie Collins and to Charlie's right, 3rd in from left, looks like one of the Will boys. Margaret Gillies and Christine White is Jimmy Lyall. 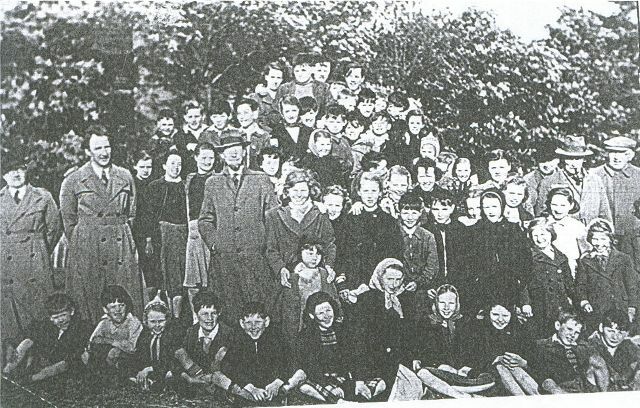 The girl standing behind Leakie's son - 2nd row, lst right is Eleanor Mackintosh. Is the man 2nd from left on the photograph Mr Clark who had the shoe shop? Yep! I reckon the man with the goatee beard is H. George of hairdressing fame. I don't remember this event but I would be astonished if I was not there - I think that's me 5th in from the right in the 2nd row. My dad Willie Geddes is at the extreme right wearing a "Colombo" style raincoat. The only other face which pops out is Norah Galloway, 3rd in from the right in front row. The play area was a huge success and the favourite piece of equipment was the roundabout, it was in constant use - healthier than computer gaming! The Will boy in in the group looks a bit like James Will, but will check with him to find out. The row behind Mr George, same row that Charlie Collins is on but on the far right end could be Zilla Mackenzie, and if it is then it's likely her sister Anne (?) in front of her. Bill, nice to see your Dad in the picture. My sister Janette and I and a few others were at your house one Hogmanay and stayed till breakfast. Your Dad brought out some lovely warm butteries. Happy memories (can't get butteries down here in Norwich!!!). Is that Ackie Innes (Shore Road) in the flat cap on the extreme right of this photo? Great photo Harry! Norah Galloway is next to you and next to her is me. Thanks to you Anne, I wasn't sure if that was me or not, but, yes, it is me. You are right, that is Mr. Clark who had the shoe shop. Harry, it's nice to see your sister Margaret in the previous school photos, thanks to Sheena. Hi Rosalie. Of course my Dad is on the left rather than the right, .....its old age you know! This is a lovely photo as everyone looks so happy. In those years after the war we did not have much in material ways but we did enjoy the simple pleasures. I have not looked for butteries in London, I guess they must be available somewhere. However when I first came to London in the 60s, I worked in the baking trade and the quality of goods was far below what was available in Scotland. Since those days I think the difference has become even more as in the South most baked goods are factory produced. Hi Rosalie, I thought it was Ben Dalgarno? Harry, looking at the photo again it could well be Ben Dalgarno. That photo brought back many happy memories. The playground was well used. Hi again Rosalie, I figured that this picture would bring many comments...yes the playground certainly was well used. I don't know how many pairs of trousers I went through on the chute. Do you remember all the boys had patches sewn on the seat of their pants? Yes, that is my grandfather, Ben Dalgarno, on the far right, third row. I was just cleaning out my parents' attic and came across the same photograph! Joan, so who is your dad then? Rossie or Ben? Pass on my regards to both, they would know me as Ryall Dunn's son, thanks. Billy, how about 4th from left front row ?